The point she was making, and one that sometimes gets lost in the controversy, is that the construction and the look of these kilns seems to match that of the original money pit right down to the flagstones found two feet down and the vault that was found during one of the attempts to find the money. Debris found inside the pit itself, and some of the artifacts found on the island also support this conclusion. The swamp area, according to Steele, would have been necessary for their work in repairing ships if her theory is correct, and the Laginas boys had found debris in the swamp that suggested there had been a ship, or ships there in the distant past. 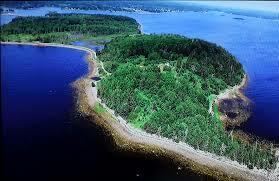 Other aspects of the Oak Island mystery are explained by the evidence found on the ground, including what appeared to be a British camp on the island in the eighteenth century. Given the real lack of results in the search for treasure, and that some of the artifacts pulled from the money pit might have been put there to induce investors to spend additional money, what she said made a lot of sense. A good answer to the Oak Island mystery. I do think it does bridge all the questions and answers. I also was wondering if it was possible to try and get Mr Robert Hastings to interview. I second the Hastings request. Interesting conclusion. Given her documentation it seems the most plausible, practically undeniable.